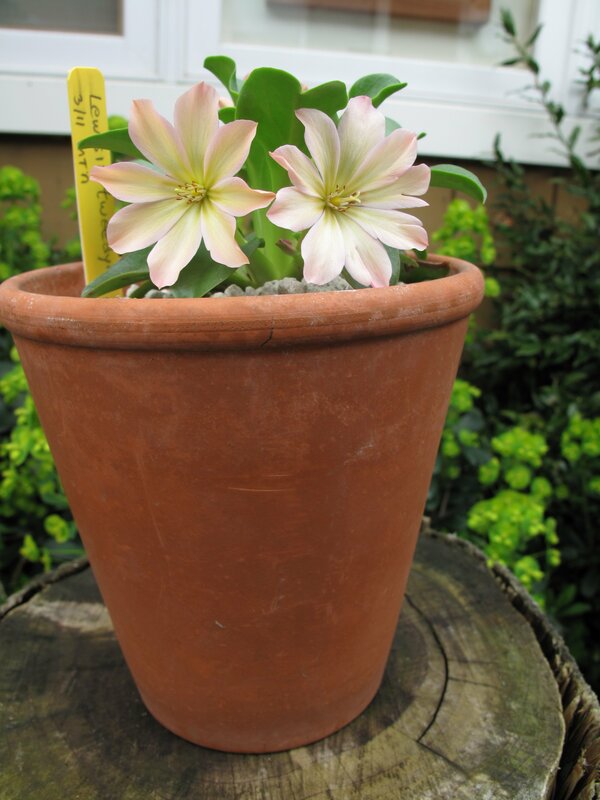 Frank Tweedy, the eponymous discoverer of Lewisia tweedyi, collected plants while working for the US Geological Survey in Montana, Idaho and Washington. He’s reputed to have collected the Lewisia that bears his name while working on a railroad survey near Mt. Stuart in the Wenatchee mountains. 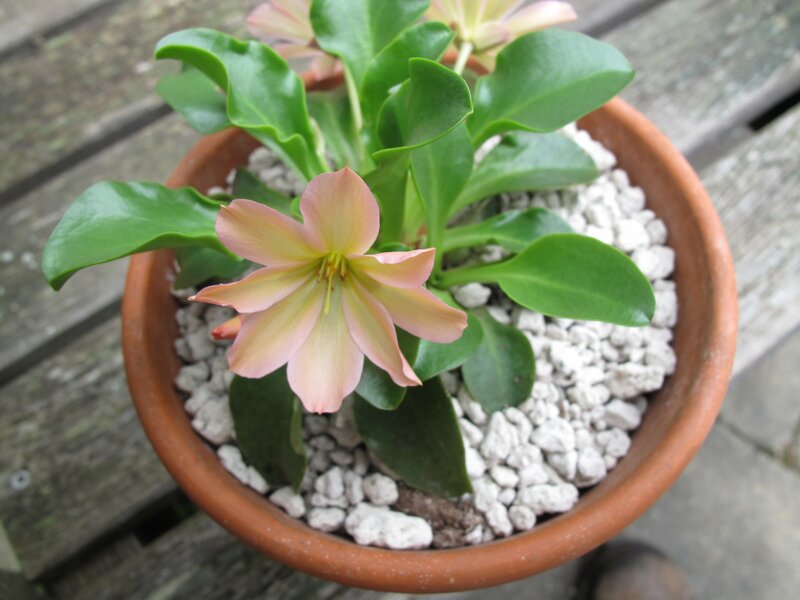 The tweedyi bloom — far more subdued than the rich (some might even say gaudy) colors of the various Lewisia cotyledon hybrids found in the nursery trade — ranges from pastel shades of peachy pink peach to a deep rich pink contrasting with shades of orange yellowish apricot. While nothing compares to stumbling on this beauty in its natural habitat while hiking in the mountains around Leavenworth, Washington; a close second may be enjoying the bloom daily on a specimen in a clay pot. Whether it’s reputation for being difficult to manage in cultivation is deserved or not, it’s toughness, like most mountain dwelling plants, is a startling fact. Years ago, I had one in a clay pot under an eave and lost track of it for at least 18 months. Discovering it in a shriveled state under some brush in early in spring I revived it with a deep watering. It recovered and made a single weak looking bloom that year. With some minimal care, it continues to bloom nicely every spring. A critical key to pot cultivation is letting it dry out after blooming subsides, keeping it dry all summer and relatively dry all winter. 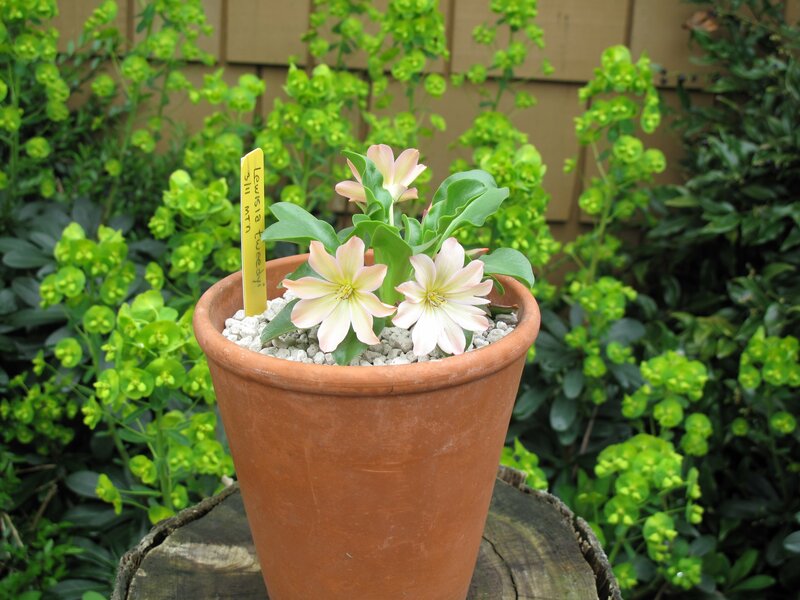 This entry was posted in Alpines, Pacific Northwest Natives and tagged Frank Tweedy, Lewisia tweedyi, Roy Davidson by Bart Arenson. Bookmark the permalink. Balony; The peach color is exactly what we see from this flowering plant in the Wenatchee area. In fact, it is the richest, pinkest pink that I have ever seen. It is almost as if this flower received all of the pink/orange thay nature had to offer. It is an oozing, luscious, pink/orange, and is one of the most exciting wildflowers out there. Thanks for your comment Kirk. I’ve never seen it in the wild. You’re fortunate to live near this amazing plant. I totally agree that it is one of the most amazing wildflowers ever and is as beautiful as anything plant hybridizers create. Score one for nature! Check out the picture of the ‘rosea’ plant I got from Richard Ramsden in Seattle. It’s at the very end of my last blog post of May 5th, “May Day in the Garden.” I will also add it to the Alpine Gallery pix. Does this one come closer to what you see in the wild? Thanks JR. It’s been at least 10 years since I last hiked around Leavenworth, probably the Icicle Ridge trail, but I’m pretty sure it was late summer. I have never seen it in the wild. I’m retired now, so maybe this spring will be the year. Do you have any suggestions where I might hike?